The Presentation Font Embedder Editable method embeds in a similar way to how PowerPoint for Windows does. Embedding this way only supports embedding of TrueType and OpenType-Truetype fonts, and unfortunately not formats such as PostScript or OpenType-PostScript. If you received the message Fonts in PostScript format, unsuitable for embedding, this means that one of the fonts that you have tried to embed is a PostScript format font and cannot be embedded. Please consider one of the following workarounds. Unlike embedding with the Editable method or with PowerPoint for Windows, the Universal embedding method, which is exclusive to Presentation Font Embedder, allows embedding of all PostScript and TrueType fonts. We encourage you to try this method instead, as it is the recommend method for most situations. You can learn more by visiting our method differences documentation page. If you target only Windows and Android users, and you would like to keep your presentation fully editable, please check the other workarounds below. Most free fonts are available in both PostScript and TrueType formats. You can search your font’s name and look for the TrueType or OpenType-TrueType version of it. If you are using a commercial Postscript font, you can contact the font designer and ask for a TrueType or OpenType-TrueType format of that font. Oftentimes font designers offer both formats. There are free online font convertors out there, Convertio is one example (no affiliation), which will take PostScript fonts and convert them to TrueType. Just make sure that the font license allows this modification (open source font licenses usually do). Launch the Font Book app that comes with your Mac. 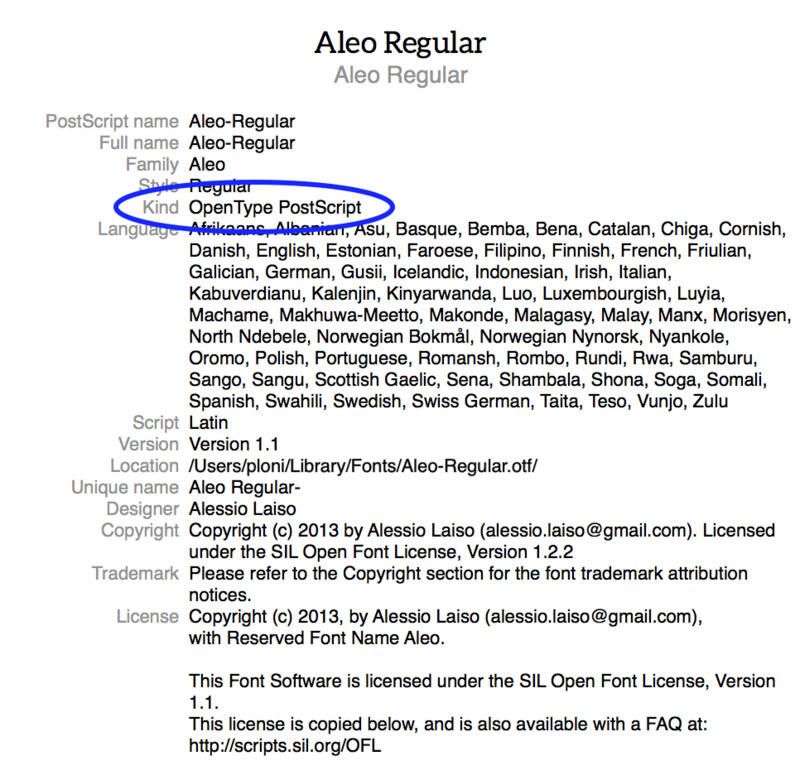 On the right upper box, search for the name of your font, for example Aleo Regular. Right click the font and select Disable (or Delete, in case you want to completely remove the PostScript version). Click File on the menu bar and choose Add Fonts…. Using Finder, select the TrueType or OpenType-TrueType version you have obtained in order to install it. Launch Presentation Font Embedder again and you should now be able to embed this font. While TrueType fonts usually have the TTF extension, some have OTF, which may lead you to believe that all OTF fonts are TrueType. However, the OTF extension stands for OpenType Format. This is a container format and therefore can contain both TrueType and PostScript fonts. The easiest way to know if a font with the OTF extension is PostScript or TrueType is to check the Kind value after installing it with Font Book, according to the steps above.